Who knows? Giving more and specific information would help. I don't really know what you mean... IF you want to limit your FPS, either limit it on the FPS limit, or check vertical sync. The later will limit your FPS to your screen's refresh rate, which in most screens is 60hz (so 60FPS). i am experiencing very low FPS with an intel i7 8700 and gtx 1070TI. there is a Photo in the first post of the options i have thicked and yet i run at maximum 60 FPS... something is not working properly. my screen is 144Hz. what kind of informations would you need? You can't just turn everything to ultra and expect good FPS, this isnt overwatch or LoL. Maybe your auto loot sensitivity is too sensitive. I ran into the same issue ever since I upgraded my computer. Older products run it better if you can get it to work [compatibility issues] my brother has a computer thats 10 years old and runs gw2 better then my New high performance gaming laptop specialized in well gaming lol. Why does it run better you might ask? Less bs plain and simple. Newer products have more protocols then necessary. Also @op if ur running 4k ur 1060 will function no better then a 1050ti. Due to the fact you didn't list any of ur specs other then that i can only comment about that. However based on the look up of i7 8700 depending on ur build you should be fine. Decent internet. NO dial up if you cant manage 5mb/s at least you need to reinvest badly. Close excess programs 70% of the process running on the new systems are worthless and you should invest the time to look up the list for your computer and permanently shut them off. last but not least go down to your panel on your computer and ensure that you actually have nvidi running lol. Cant tell you the times i've seen people running intel graphics thinking they had nvid running your computer should have UHD integrated graphics so the game may be running off that. It is, indeed. But yet, it's true. I've compared them side by side, in same instances (dungeon) where performance are not as much impacted by random variables as other maps. OP is running a 1070Ti. He didn't talk about 4K. Hey OP ! I just thought about our commom issue, and ran a few more tests. I might have found something interesting. Everyone knows that GW2 is running on single-core, but it actually have a very bad time with multithreading technology. I disabled Multithreading in my BIOS, and I'm back to 100FPS in instances (preciously around 50FPS). You should give it a try. However, my other programs will be impacted by this change, so I'm planning to disable it only when I play GW2. Your CPU is running at full speed : open Task Manager, go under Performance tab, and click on CPU. Down below, you should see the clock speed (your should be around 4.6Ghz). If it's not the case, make sure that you have Intel TurboBoost enabled, and that your Power Options (Settings => System => Power & Sleep => Additional Power Settings (right side of the panel) => select (or create) High Performance plan => Customize Plan Settings => Change advanced Plan Settings =>Processor power management => 100% at max usage. Also checkout your BIOS settings about Power Management plans, and disable it. I have an i5-8400 and a 1060 3gb, I run a 144hz monitor and I get 150 in the old world and about 80 in the new zones. Maybe turn down a couple settings. Just built a new rig and am having similar issues, even after trying all the suggestions posted here. At first I thought it may be Reshade causing the slowdown (on a 1080 Ti, though? ), but there was no change whatsoever after turning it off. Getting between 30-45 FPS most places, around 60 in certain maps (if they're empty), and 80 in very simple sections of map (desert) with nothing else around. Never higher. That's only slightly better than my 6 year old setup. I'm not mad I upgraded, but I guess I was just expecting better. The bottle neck may be my internet connection, I suspect there's some latency, given the signal is never particularly strong, and I'm several rooms away from the router. I'm getting a second access point installed in my room so I can have a wired connection and will report back in a week or so when it happens. Anyway, anyone with a similar setup having these issues? I remember seeing a video on youtube of someone running it at 4k on a 1080Ti and it would only drop to ~35FPS in the most chaotic, populated situations. Same issue. [email protected] / gtx1080 8gb. Game runs mostly at sub 60 frames (unless I'm looking at the floor) regardless of quality settings. If I turn everything down I get maybe +5-10fps total. Is this normal? I thought my rig would be enough to at least maintain 60fps. Have you guys tried disabling Hyperthreading/Multithreading ? It's definitely normal in most areas with a lot of players on screen. Even for modern day CPU's it's a mind-boggling task trying to power through 50+ characters on the screen doing all kinds of unique animations and skill effects every second. You should be able to adjust things like Character Model Limit and Character Model Quality in your graphics options to score some FPS. In your case orfeolis it might be the case of a ton of npc's being on the screen. It doesn't look like too many players are around. I've also wondered if it's just an optimization issue for Heart of the Mists.. I've heard several people in map chat complain that the lobby is really laggy for them. Disabling multithreading is impossible. It's an inherent function of the operating system. Hyperthreading might or might not be worth messing with, since it affects only the way in which the OS assigns threads to processor execution units. Thanks for the heads up! I haven’t tried it yet, but I guess I won’t. I also would find it a bit annoying to have to restart, go into bios, and disable it, and have to do it again when I stop playing. Haven’t been on much the past few days, but I’m actually getting a wired connection installed today. I’ll play around with character model settings and see what happens. That's weird. I experience +20-40FPS with disabled Hyperthreading, on my i7-7850H. It's not normal to have -50FPS when upgrading to a +80% faster CPU and a +40% faster GPU. Actually, it's more like GW2's Engine is based on GW1's engine, which was built at a time Multi-Core Processors weren't even a thing, and everything was optimized for single-core PCs. GW2's Engineers have since shifted some load into secondary threads, but the engine is nowhere near close to being optimized for multi-core CPUs. Those "new protocols" run of APIs like DirectX. And since GW2 is still using DirectX 9, it's still running of those old protocols. The other problem is, that most Hardware developers are deprecating DX9, since Microsoft stopped supporting it in 2017. Meaning software running DirectX9 will start running less and less efficiently in newer hardware because it's not supported fully. GW2 depends on single core performance. An I7-8700 has a 3.2 GHz single core speed, while a i7-960, which was released in 2009, also has 3.2 GHz single core performance. For GW2 those two processors are very similar, even though they are 9 years apart. Laptop CPUs usually have less clock speed than desktop CPUs. That's why your brother's machine runs faster. The overall CPU usage doesn't mean anything, you need to check your cores individually and see if any one of them reaches 90%+ usage. The generation of your CPU doesn't matter and your GPU also is of little use when the bottleneck is the CPU single core performance. You can start by posting your graphics tab with the fps counter on both machines. Those results don't look real at all. There is no i7-7850H on Intel's Ark so your CPU is something else. Wouldn't it matter since the IPC would be greater with the later generations? Haswell (Gen 4) and up to Coffee Lake (Gen 8) Intel CPUs have the same IPC. I just noticed a mistake in my post, the 4790k runs at 4.0 GHz, not the 4770k. Not sure what to make of this, but 40 fps with seems way too low for this rig. Either I'm spoiled with all my games running at 100+ fps and this is perfectly normal for the gw2, or there's something eluding me about how to run gw2 in 2018. Problem is I want to play like crazy but the fps dips make it unbearable for me, I'm just curious if this sub-par performance a core "feature" so I can move on. @wanya.1697 hmmm so you are telling me that the fact that core 0 and 4 are at 80% is the problem here? Doesn't seem I can to much about it Quite disappointing tbh, really wanted to come back to gw2, but playing at 40fps ruins it. 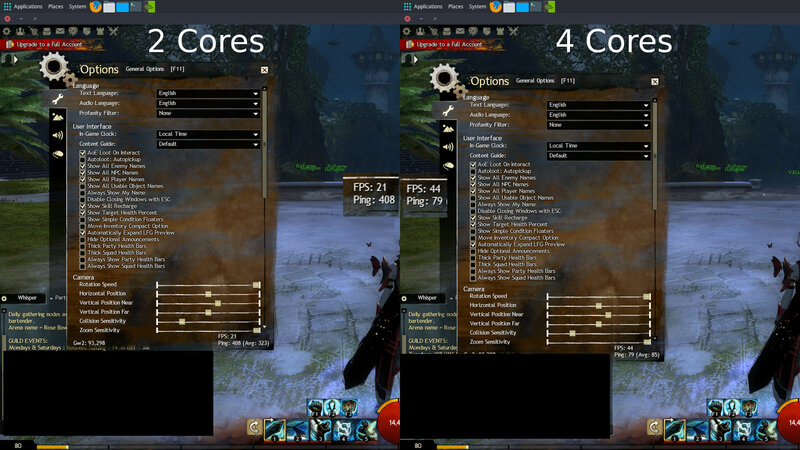 This looks normal for GW2, those 2 cores have really high usage which is the problem because GW2 uses mostly one core for its main thread. There is indeed nothing you can do, other than increasing the graphic settings (by a lot), your GPU can handle it. Leave character model limit at low though as that affects CPU performance more than anything else. You won't go above 40-50 fps but at least you will be playing the game at near maximum settings. it is assumed that when new technology comes out, legacy api's performance gonna get carried and will improve. looks like technology goes into reverse. Some of the screenshots in this topic definitely have too low fps considering the PC setup. There is something wrong with your system, but can only wild guess here as to what it may be. Also make sure that your RAM is running in dual channel and enable XMP profile. Additionally it is not true that old generations of CPUs would run similar or even more FPS than newer ones. Altho in many cases the differences may be small, but newer generations should always be faster. Even if CPUs have the same clock, it is ignorant to assume that an old generation CPU with the same clock is equally fast. Single core performance of newer CPUs is still improved compared to older ones even at same frequency. Additionally newer generations of CPUs are coupled with faster ram and all that added together DOES make a difference. All that being said, it is not worth to upgrade from i7 4790k to i7 8700, or ryzen 2700x just for the sake of guild wars 2. You will be disappointed. The screenshot posted by @orfeoulis.4325 definitely shows way too low FPS considering on screen situation, settings and PC setup. I'm running [email protected], dual channel ram @ 2133Ghz and a r9 290x and will get 50-60 fps on all high settings in a crowded pvp area, easily. So there is definitely something wrong with your system. 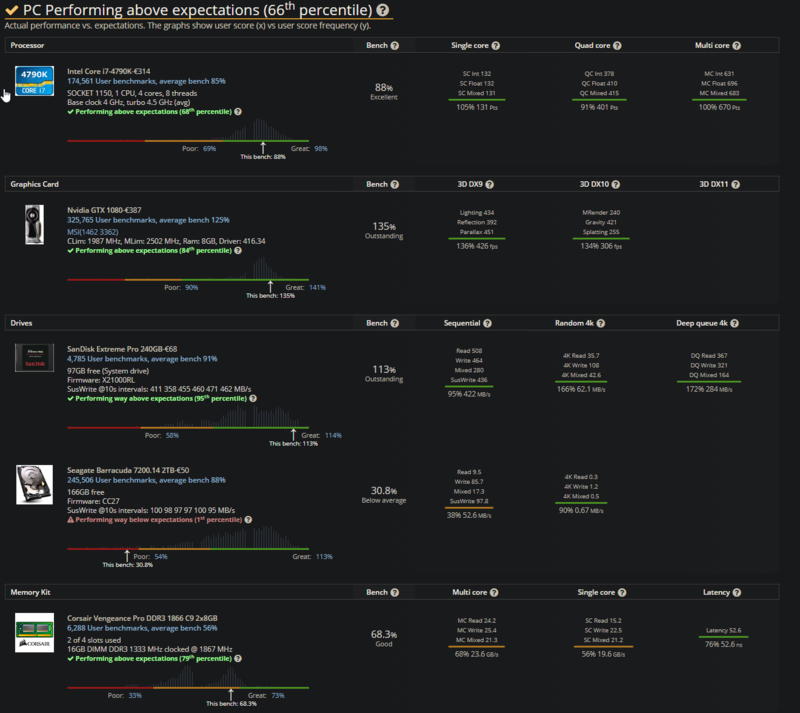 Go to userbenchmarks.com, test your system and you might get some clue if any of your parts are underperforming. Those threads rise every week. The answer is always the same: GW2 uses a 12 year old engine with dx9c. It's horribly optimised. And that's why you get kitten FPS. @samo.1054 here's my user benchmark, https://userbenchmark.com/UserRun/11990174 looks pretty ok I think. Ignore the terrible hdd performance, i'm running gw2 from my ssd anyway. Also please note that GW2 is the only game that gives so terrible performance. And by terrible I mean consistent below 60fps drops. 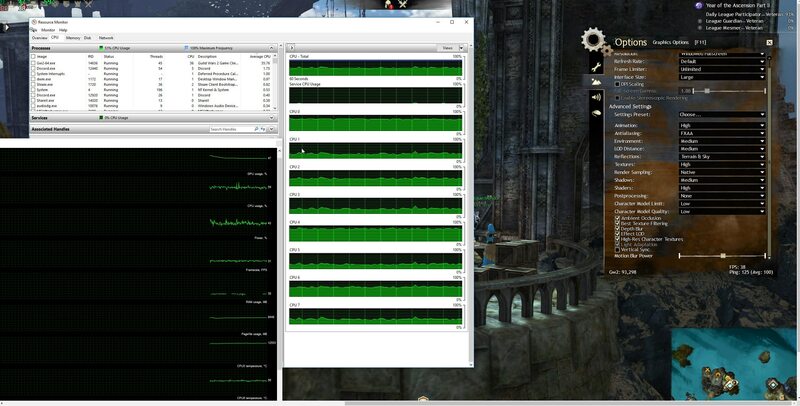 @orfeoulis.4325 Yeah that benchmark looks decent enough. Very similar to mine, my RAM results are 10% better, but that shouldn't make that huge of a difference that I'm seeing from my experience and your screenshots, so I'm a little out of ideas here. I could apply your exact in-game graphical settings to my PC and take a few screenshots in the mists to see exactly what difference we're talking about. @orfeoulis.4325 yep, my benchmark is even higher than yours, and I get similar to worse FPS. shrug I still consider the game playable, it looks pretty enough, and the frames never slow down enough for me to not be in control. I guess I'll take it. To be completely fair, SPvP performance very smooth is at 100fps average, but the framerates in the new Elona zones are very poor. I just can't force myself through it and I understand most people don't care or won't even notice the low framerates and I'm jealous. Anyway, it is what it is, at least thanks to the people posting here we confirmed it's not only me and that it's an optimization issue. Fingers crossed Anet will address this next expansion! Not sure what your point is, do you mean that if I buy a 2k$ PC today and GW2 runs at 40fps it's logical because "old engine"? WoW's engine is also ancient and uses only one core (they are adding multi-threading next patch btw), but at least performance is very waaaaay better compared to 15 years ago as someone would expect. Or are you indirectly and politely saying that GW2 is terribly optimized compared to other titles? May I ask where did you get the info that WoW uses only 1 core? Also keep in mind that Blizzard made quite a few updates to the engine, they even added DX11 and I'm pretty sure if you limited the game to 1 core manually it would run at less than half the fps. For GW2 even a 2k$ PC won't net you 60+ frames everywhere, for starters a high end GPU is a waste as it relies a lot on CPU power and while CPU performance increased over the years it wasn't by much. Last year I upgraded my system from an i5-4590 + GTX 960 to a Ryzen 1700X + GTX 1060, the difference in many cases was almost equal except for large group fights where the Ryzen had a small advantage. maddoctor.2738 pretty much nailed it with the Crysis 1 example, that game's performance is still bottlenecked by the CPU. I gave you an example of another title (Crysis) where a 2k$ PC today would get similar performance to a -powerful- PC from nearly 12 years ago, because it uses a single core more than any others. That's what happens when a game engine isn't updated to meet the new standards. WoW's engine has been updated numerous times over the years, the GW2 engine hasn't been updated at its core, they added lots of new features like shaders (karka skin for example), particle effects (wyvern flames), and post processing (Path of Fire zones) but the core of the engine (threaded performance) was never updated to use all cores properly. The good news with that same example I used is that Crysis 2 and onwards threads wonderfully, Crysis 3 although way more impressive visually compared to Crysis 1, runs at almost double (or even triple) the FPS because it is threaded better. Which means Anet could pull this off too if they wanted to spend the required resources to do so. Yes. Gw2 is dated. It runs at 2 threads with one thread that deals with network, sound etc while the other thread that does everything else. It is because it runs at 2 threads while having a lot of bling bling, it actually single core performance demanding. It is a dated programming and for them to update to use more than 2 threads means, depending on the scripting and simulations they have used, they would have to solve sync issue of various difficulties. While multithreading isn't exactly new, it doesn't mean many devs knows how to work with it in a development team, it won't be rare to see devs mixing up the various branches and create more bugs. As for if there is any justification to support 4 threads, there isn't any justification not to. According to steam's survey on hardwares, great majority of the pc support 4 threads. In other words, there is nothing for you to change in your settings (other than reducing the all graphic to lowest) to gain more performance. The only way for you to gain even more performance in gw2 is overclock your processor. The rest of the settings will barely affect performance if your machine is bottlenecked by the CPU. The best option is to turn everything to maximum so although you have 30-50 fps, you at least see a pretty game. Performance can be also be affected by other programs running in the background. A simple example is with dual screen setups, it's common to have a dual screen setup with the game on one side and browser on the other, if you open a youtube video at 1080p while gaming, chances are you'll suffer a performance hit already.